Yeti Snow Technology was founded as a 50/50 joint venture between Øveraasen and Semcon to develop autonomous snow removal vehicles that keep airport runways clear. Øveraasen is the world’s leading manufacturer of special machinery for airport snow clearing and is based in Norway. Semcon is an international technology company specialized in product development. Semcon has head office in Sweden, with locale representatives in, among others, Norway. Together as Yeti Snow Technology, Øveraasen manufactures the machines for clearing snow from airport runways while Semcon develops the system for autonomous operation. Airports strive to be as efficient as possible, however even the most operationally efficient airports are impacted by extreme weather conditions. In such climates, snow and ice can cover runways, subsequently grounding planes and creating a ripple effect of canceled flights across airports regionally, nationally and globally. The need to have clear runways makes staffing for snow removal in these windows of inclement weather an expensive operational requirement due to changing, and often inaccurate, weather patterns. To address this challenge, Yeti required that snow removal machines stay within their planned autonomous paths with centimeter-level accuracy. Two snow clearing vehicles (sweepers) drive in a coordinated manner to clear snow on a runway. For the coordinated operation, it is critical that the vehicles stay on their paths, otherwise important infrastructure may be damaged, such as airport lamps. The vehicles must clear the snow to the correct side and depending on the given conditions, the two vehicles must have overlap so that there is no snow left behind between the vehicles. Yeti discovered that real-time kinematic (RTK) GNSS delivered the required position requirement with accuracy within the range of 1-2 centimeters. During initial testing, Yeti implemented one GNSS module per vehicle using Swift Navigation’s Duro ruggedized receiver. Initially, one receiver delivered inaccurate heading control with the position fluctuation of more than 10 centimeters. This was attributed to pendulum movement of the driver’s cabin on the truck. These real physical movements on the antenna position were due to the placement of the antenna on top of the cabin that led to varying position measurement and difficulties calculating the right heading based on position history. To solve the heading problem, Yeti implemented a second Swift receiver. Piksi Multi was added with antennas placed within approximately 2 meters distance on the cabin. As the general movement of the cabin is perpendicular to the direction of vehicle movement, the movement of the cabin still influenced the vehicle’s position measurement but the heading information became centimeter-accurate and stable from this point on. Two GNSS receivers have been implemented per vehicle; one Duro and one Piksi Multi, which are connected to provide heading feedback. Piksi Multi is also used as a base station. This solution was tested in Norway between December 2017 through March 2018 in temperatures that reached -15 degrees. The culmination of this test was a demonstration at a live snow clearing event in March 2018 at Fagernes Airport Leirin, Norway where autonomous plows 20 meters long and 5.5 meters wide were able to clear an area of 357,000 square meters every hour. Yeti has the goal to develop an autonomous snow clearing service for use on future airports. The product will be introduced in steps, in parallel with the development of technology for self-driving vehicles. The first step will be a planning tool for airport winter operations. Next up will be a measurement and monitoring system that increases the know-how of operations being performed. 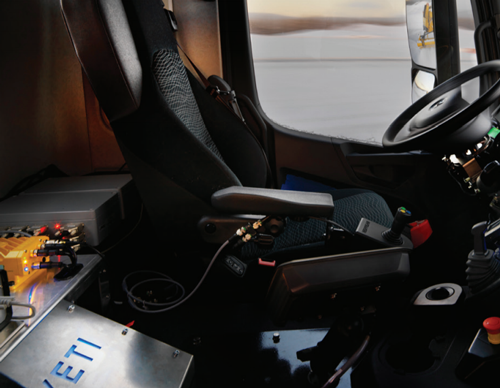 Driver guidance will be a natural step along the way until the maturity of the vehicles has reached a level where the snow clearing may be made fully autonomous.